Nail guns: You can aim a nail for precise placement and stop worrying about bent fasteners or hammered thumbs. 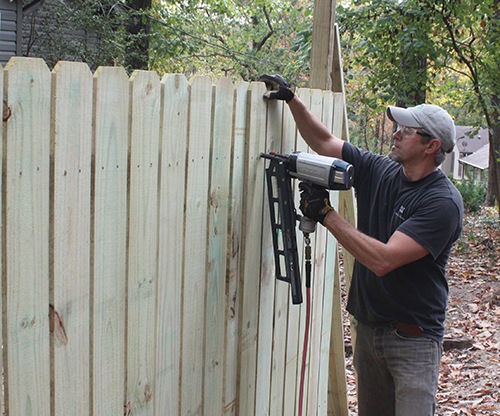 Nail guns also spare your elbow a lot of wear and tear, and they drive nails with a single pull of the trigger, which saves tons of time compared to making multiple hammer swings for every nail in the project. Do I recommend them for a serious DIY’er? You bet I do. But what nailer makes sense for you? 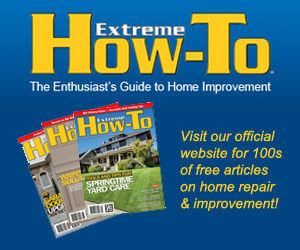 If you already own an air compressor and air hose, then a pneumatic nail gun will give you the most bang for the buck. If you don’t own one and you plan on handling your own home improvements, then investing in a compressor system can be a sound power-tool investment. One of the biggest benefits is that air tools don’t have their own motor. This makes the tools lighter, more compact and easier to handle—with less moving parts to malfunction. For this reason, air tools are known for their long-lasting value. With cordless electric tools, you have lots of small motors that can wear out, batteries to recharge, and rechargers to store. But with air tools, you have a single powerful motor to run them all, so they can perform for years without failure. As far as nail guns, you’ll also find the widest range of tool styles to be powered by air. Choose from pin nailers, brad nailers, finish nailers, framing nailers and even roofing guns all driven by air power. This means you can add to your air nailer collection as future projects demand. As much as I love air tools, I do a lot of nailing, so it’s nice to have a cordless option that’s ready to grab and go. An air compressor can be heavy and bulky, and even the portable models can be cumbersome to move around. The air hose can sometimes get in your way or become tangles, and you’re limited by the reach of the hose as well as the availability of an electrical power supply. Plus, although an air-driven nailing system is an excellent setup for a worksite, sometimes you have a simple repair around the house that requires only a few nails, then you’re finished. 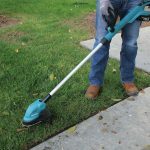 It can be a chore to drag out a hose and compressor for small, quick jobs. 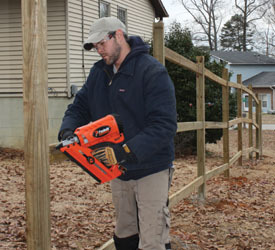 In these situations, a battery-powered cordless nailer gets the job done without the extra baggage. 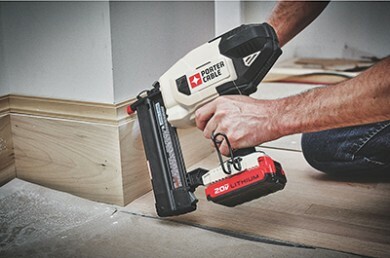 This cordless category is populated primarily by brad and finish nailers (15 to 18 gauge) powered by lithium-ion batteries. A number of reputable manufacturers make them, including Paslode, Bosch, Dewalt, Hitachi Power Tools, Senco, Ridgid, Ryobi and Porter-Cable. 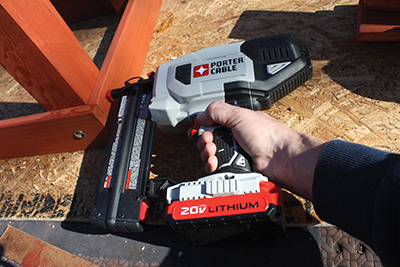 Recently, I’ve been using the Porter-Cable 20V Max Lithium Ion 18-gauge Cordless Brad Nailer for some trimwork and for building patio furniture. It’s a lightweight (5.1 lbs), well-balanced and solidly constructed gun. It has a fastener-length capacity of 5/8 to 2 inches and a magazine capacity of 100 nails. The nailer is capable of driving up to 450 nails per charge using a 1.5Ah battery and up to 1,300 nails per charge using a 4.0Ah battery (sold separately). It has several tool-free features including a tool-free jam release, tool-free depth adjustment wheel, and a tool-free “stall release lever” that resets the driver blade after a nail jam to reduce downtime. To drive a 3-1/2-in. framing nail through solid lumber requires a little more oomph than a battery delivers alone. 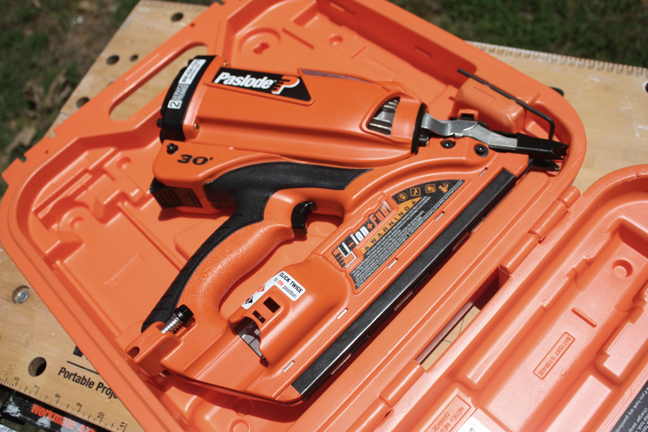 To cut the hose for a framing nailer requires a combination of both battery power and gas fuel rods. When the nose of the gun is pressed to the work surface, flammable gas fuel is released into the combustion chamber and a fan mixes it with air. When the trigger is pulled, a spark ignites the gas mixture, creating combustion that drives the nail. Sounds cool right? They are; in fact, every pro builder I know is in love with these things. 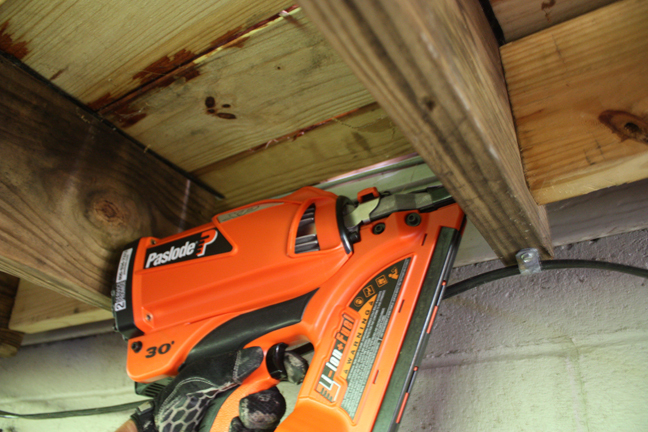 But that coolness comes at a price, as the flagship tool in this category—the Paslode Cordless Framing Nailer—can run $300 to $400, depending on model. Whether or not the cost of the tool makes sense for you depends on how much nailing you do (and how much you just love owning cool tools). I will say this: The reason all those pros are so in love is because the cordless framers offer all the performance of an air-powered tool without the hassle of the extra machinery, which means time saved on the job. To a contractor, time can equal money, and that saved time will soon justify the cost of the gun. As for me, I’m hooked. 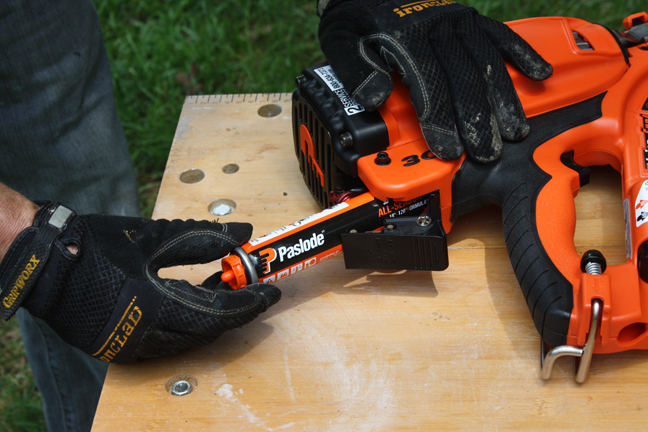 I have experience with a few generations of the Paslode Cordless Framer, and the strides the company has made in the tool’s runtime and efficiency are truly remarkable. 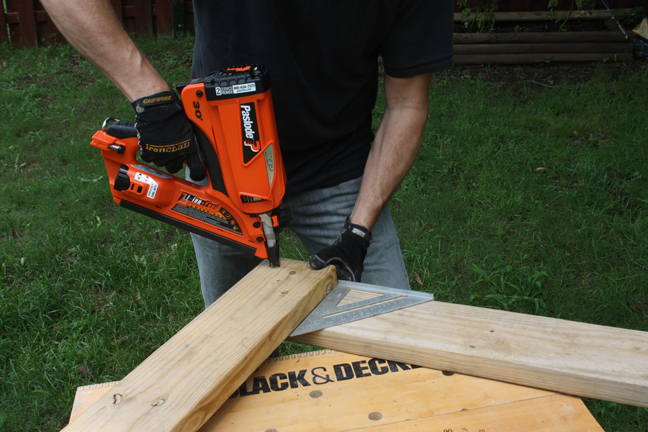 The latest model, the CF325XP Lithium-Ion 30° Framing Nailer, delivers 15 percent more power than its predecessor. With a 7.4 V lithium-ion battery, it delivers up to 9,000 shots per charge. For a full battery, recharge time is 1-1/2 hours, but a 2-minute quick charge will give you up to 200 extra shots! The framer is lightweight at only 7.2 lbs., and its compact design fits between 16 in. on-center studs, joists, and roof trusses. Plus, for those of you in a cold climate, the new Paslode Framing Fuel with All Season Formula lets you keep working in temperatures down to 14 degrees F when compressor hoses are freezing. For “extreme” DIY’ers and pros on the go who have heavy-duty projects ahead, a cordless framing nailer is a worthy investment … and quite possibly your next favorite tool.